Car USB charger, voltmeter and thermometer 3in1, 12/24VDC Car-mounted USB charger with 5 VDC output, voltmeter and thermometer suitable for 12 and 24 VDC car batteries, model DF-01-PTV.1. Volt-ammeter 500VAC / 100A Volt-ammeter 130-500VAC / 1-100A with LED display, with current transformer in the kit. List Price 37.90лв. VAT Incl. 36.00лв. VAT Incl. 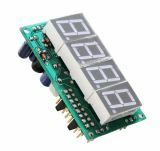 Digital Voltmeter DC, 0 - 70 V DIgital voltmeter with operating voltage range 0 to 70 V.
List Price 29.00лв. VAT Incl. 27.55лв. VAT Incl. 26.10лв. VAT Incl. List Price 19.00лв. VAT Incl. 18.05лв. VAT Incl. 17.10лв. VAT Incl. Digital Moto Clock This device is designed for measuring devices and machines working hours in order to be properly maintained and to be avoided any dysfunction. List Price 23.90лв. VAT Incl. 22.71лв. VAT Incl. 21.51лв. VAT Incl. List Price 10.95лв. VAT Incl. 10.40лв. VAT Incl. 9.85лв. VAT Incl. 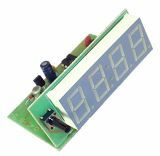 Volt-Ammeter, digital, 0-100VDC, 0-10ADC Digital Volt-Ammeter for DC voltage measurement with voltage scale 0 - 100 V and current scale 0 - 10 A. Frequency meter 1Hz - 60MHz, accuracy 1Hz The frequency meter includes PIC16F627A and can be used as measuring instrument for sinusoidal frequency wave 1 Hz - 60 MHz. It can operate with a couple of preset values.